About freaking time! Intermittent sources of power require massive storage capacity which is freaking expensive if you want a modern American lifestyle like 99% of the world population does. It is the very real start of a movement that recognizes that powering the world with 100% renewables is a myth – and that chasing a myth will not get us to our global goal of meeting the world’s increasing energy needs while reducing carbon emissions and successfully combating climate change. Hmmm. And according to the WEO graph in the article, in 2040 most of the world aside from the EU STILL projected to be burning coal for OVER 20% of their electricity production. Either the greens ala Tony Seba et al or the standard predictors re burning fossil fuels en masse for electricity generation as far as the eye can see are very very wrong about the future economics of Solar PV in the coming two decades. Else, why in HELL is virtually everyone burning SO MUCH coal over 20 years from now if its so dirty and terrible? At least surely moving to almost all (seemingly dirt cheap) natural gas would be far better if Solar PV isn't going to get much cheaper as the greens forecast. (I understand this in the third world which has limited capital and wealth per capita, perhaps, but not in the first. And if PV backed up by batteries is going to be so cheap as to put most utilities out of business, then what gives? AdamB, you tend to talk sense and facts in these areas. Any insight? Because something doesn't come REMOTELY close to adding up here. Process would use iron ore pellets; and hydrogen rather than coke or coal. Emissions would be water instead of CO2. If they use Hydroelectricity/Geothermal electricity to split water to get the H2 gas needed then maybe this will be a carbon free process. I am willing to be impressed but first show me where the root energy supply to manufacture the Hydrogen comes from. Peroxide is basically the perfect fuel. 1) It can be stored long term and does not require compression like H2 which also happens to leak at serious rates from any container. 2) Combustion of H2O2 does not produce NOx as does the burning of NH3. And CO2 from the combustion of CH4. 3) Fuel cells can use H2O2 as both the reducer and oxidizer and do not require a membrane. 4) Catalysts can be used to produce H2O2. The large energy penalty of electrolysis is avoided. There are are catalysts for producing H2 as well, but H2 has too many minuses as an energy carrier. 5) This is not a joke: currently areas around heavy traffic can be partly O2 depleted thanks to combustion using gasoline and diesel. At 19.5% concentrations, O2 becomes biologically deficient for humans. H2O2 fuel cell combustion releases O2. Except that hydrogen peroxide is rather difficult to manufacture. Hydrogen peroxide - Wikipedia describes two main methods. Electrolysis of ammonium bisulfate. It makes ammonium peroxysulfate, when can then be hydrolyzed to ammonium bisulfate and H2O2. Reduction and self-oxidation of anthraquinone. The reduction part is combination of anthraquinone with hydrogen using a palladium catalyst. Adding oxygen then oxidizes it, releasing H2O2. Carrying H2O2 along as an oxidizer means carrying a lot of extra weight without anything gained, since one can more easily get O2 for the surrounding air. The only exception is in outer space, where one has to take one's oxidizer along with one's fuel. The production of H2O2 requires electrolysis, and it may be simpler to make hydrogen or ammonia from that process, and for hydrogen, do some Fischer-Tropsch reactions to get something that is easier to store. The hydrogen peroxide oxidizer (called "T-Stoff") mixed with the blended methanol/hydrazine fuel (called "C-Stoff") in the rocket engine combustion chamber and spontaneously burned (hypergolic ignition). This was a very dangerous airplane that repeatedly exploded on the ground before launch or in the air when pierced by a single bullet from a bomber's machine gun. 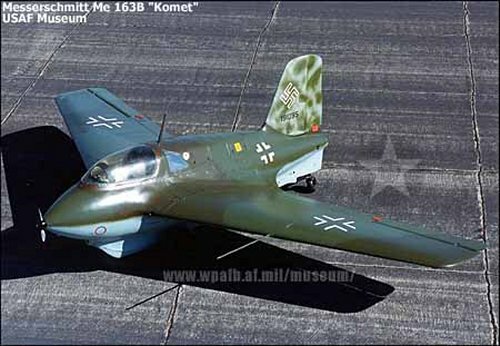 However, it went 700mph when a front line piston engined airplane went 350mph when fully loaded with fuel and armaments. It also had a 30mm cannon, which could destroy another fighter with a single shot, or a large bomber with 4-5 rounds. dohboi - "Process would use iron ore pellets". And what is the fossil fuel free source of those iron pellets? ROCKMAN wrote: dohboi - "Process would use iron ore pellets". And what is the fossil fuel free source of those iron pellets? Are you talking about mining without using fossil fuels? i - I'm referring to the implication that steel is being created without the use of ANY FOSSIL FUEL. Great if it reduces the total amount of ff used in the process of creating steel. But it still requires some utilization. Interesting that a man with a reported net worth of $23.6 BILLION had to be induced with a $750 MILLION subsidy from the state to build his solar plant there. And now the state's politicians are wondering if they made a bad investment. At least Elon doesn't lay awake a night wondering the same thing. I guess that's how you become a billionaire. LOL. "Inside Tesla's troubled New York solar factory" Reuters - Tesla Inc’s (TSLA.O) production of solar roof tiles has been delayed by assembly-line problems at its new publicly subsidized factory and difficulties producing a product that satisfies the aesthetic demands of CEO Elon Musk, eight former and current employees of both companies told Reuters. If I lived in Alaska and had sled dogs, I would certainly find out. BTW: I don't have much use for people who don't like dogs. There are more people than dogs on the planet. Perhaps we should have people generating power this way! In the days before electricity tread mills were pretty common any place where a water wheel was not practical. There used to be a treadmill at the local fairgrounds that was sized for a team of horses It took about six kids to make it go round without any load on the flywheel. ( I was one of the kids) I don't know what they used it for when it was new. Other types ran things like cream separators or corn shellers. One in a neighbors barn was run by a sheep or goat to run the cream separator. They were also used wherever a high speed rotation was required like a wood lath or drill. The slow speed of the treadmill was geared by belts and wheels to get to the needed rpm of the final tool. I saw a horse treadmill demonstrated once, it was powering a threshing machine to separate the seed from the stalks. County fairs used to demo old time methods but these days its all about showing 4H projects and sending people through the merchant buildings to sell them knick knacks they do not need. sub - Certainly are alternative. Just saw a Dirty Jobs episode about a water powered corn grinding mill over 150 years old and still operating commercially. But at max only capable of supplying less then 1,000 families. And you had to go to the mill to pick up your own flour or grits. Compare that to a fossil fuel powered operation that supplies many hundreds of thousands of families. And it ships the product hundreds if not a 1,000+ miles to their grocery stores. Back to that same damn scale problem. ROCKMAN wrote: sub - Certainly are alternative. Just saw a Dirty Jobs episode about a water powered corn grinding mill over 150 years old and still operating commercially. But at max only capable of supplying less then 1,000 families. And you had to go to the mill to pick up your own flour or grits. Compare that to a fossil fuel powered operation that supplies many hundreds of thousands of families. And it ships the product hundreds if not a 1,000+ miles to their grocery stores. Maybe we need to go the other way on scale. There are plenty of hand powered grain grinders available. Most families have someone capable of spending an hour a week turning the crank. That is about all it would take to produce enough flour or cornmeal for a family for a week. Lets kick the big guys out of the game, and move the work down to the people who need the exercise. "It don't make no sense that common sense don't make no sense no more"